Can Paintless Dent Repair Take Out a Crease? This is a question I am often asked. Many people want to know if a crease in their car can be removed with the paintless dent repair method. Well… Yes It Can. With all the DIY, Do-It-Yourself, dent repair videos on Youtube and the places online showing how to get a dent out of your car, the exposure to how professional paintless dent repair is done is limited. Most of those DIY videos will show you that dent repair is done by just “popping” the dent out with suction cups or heat and dry ice or compressed air. So when it comes to having a creased dent in your car it may seem like those methods would not work. Professional Paintless Dent Repar is done in multiple ways with PDR tools. We use special hardened steel rods that are used to gently move the metal back out from the inside of the panel. We will use special glue and tabs, that are made especially for PDR so they will not damage the paint, to pull the dents out. This “glue pull” method is not always used to just “pop” the dents out. It is used to pull out the dents to minimize the amount of pushing that we need to do from the inside of the panel. We also use special hammers and tools to “knock down” the crowns and work with the metal on the outside of the panel to properly flatten the area. These hammers are a critical tool in the paintless repair process because of the way the metal reacts when it is dented. It does not just go in but also moves out. This is the reason that the dents don’t just pop out with other methods. This is the reason that the dents don’t just pop out with other methods. 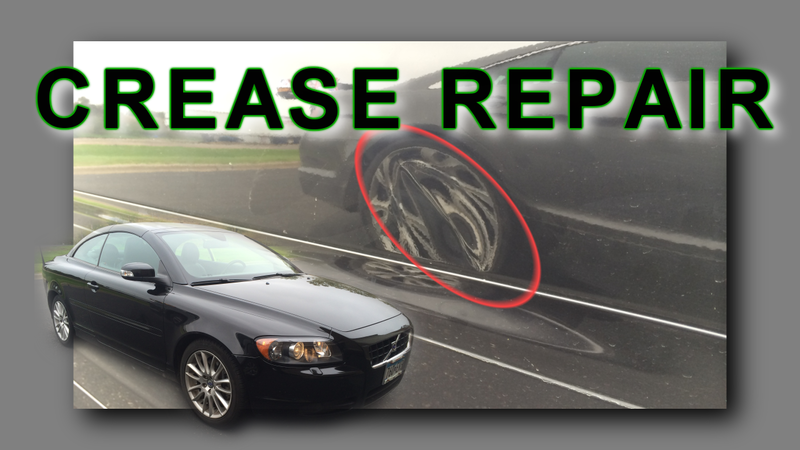 In this video you will see the Professional Paintless Dent Repair method being used to remove this crease dent from the door of a Volvo. The glue pull method was used to minimize the pushing needed with regular PDR tools and also because of obstructions inside the door panel that made using those dent removal tools impossible.